The John De Laeter Centre (JdLC) for Mass Spectrometry was formed under the WA Centres of Excellence Program as a collaborative research venture between Curtin University, the University of Western Australia, CSIRO and the Geological Survey of Western Australia. The purpose of the centre was to carry out research and development of benefit to the minerals, petroleum and environmental sectors using advanced methods and techniques in mass spectrometry. The consortium successfully established the WA SHRIMP Facility. In 2017, the JdLC transformed into Curtin University’s analysis and characterisation facility with 15 laboratories and $33M in research infrastructure under centralised management. ICP-MS (Agilent 7700X series) combined with an excimer laser (RESOlution). A helium mass spectrometer (Alphachron). These hardware components were integrated to create a new instrument platform (RESOchron) capable of in situ U-Th-Pb-He isotope analysis (Danisik et al., 2017). This instrument is being commercialised by Australian Scientific Instruments. Prof. Chris Kirkland operating the SHRIMP instrument at Curtin University. Image: ©Curtin University. The Cameca IMS 1280 Secondary Ion Microprobe is a $7M microanalytical research instrument located in the Centre for Microscopy, Characterisation & Analysis at the University of Western Australia. It uniquely measure in situ stable isotopes at micro-scale. The instrument was commissioned in 2010 and is operated and maintained by CMCA. 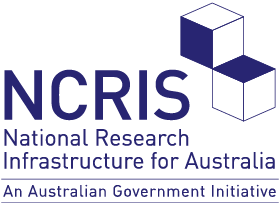 Funding was made possible by Auscope ($1.5M), AMMRF ($1.5M), the Western Australian Government ($2.5M) and the University of Western Australia ($1.5M). Cameca IMS 1280 Secondary Ion Microprobe at the University of Western Australia. Image: ©Brent McInnes. 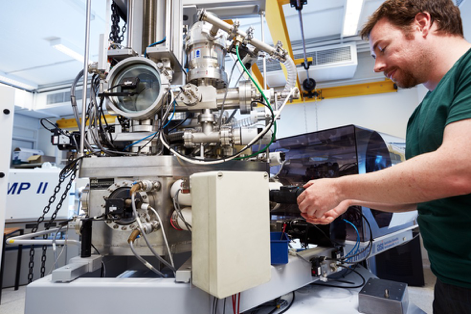 AuScope has supported the Thermochronology Research Group at the University of Melbourne in accessing technical support for the development of automated scanning technology for fission track analysis. This integrated software and hardware system combines innovations in digital microscopy and image analysis to bring about a step-change in data quality and quantity for low-temperature thermochronology applications. This instrumentation initiative culminated in the installation of 24 commercial systems in 14 different countries. a major upgrade to the Control Computer and operating software for the system allowing the previously semi-automated control, requiring constant operator supervision, to bea fully automatic operation allowing for samples to be run much more efficiently and over more extensive periods including overnight autonomous operation. 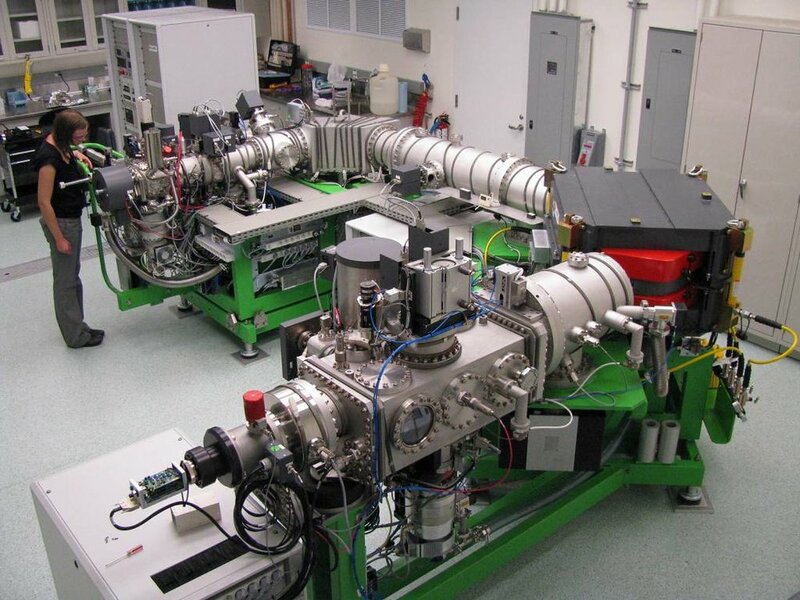 Both the Automated Fission Track and (U-Th)/He Thermochronology, are fully operational and experience high levels of demand from researchers within the university’s research group as well as elsewhere in Australia and overseas. Prof. Andy Gleadow and his Thermochronology research group in the University of Melbourne. AuScope support enabled the Australian research community to obtain greater access to TerraneChron, Macquarie’s unique methodology for studying crustal evolution and evaluating the metallogenic potential of terranes. TerraneChron is a cost-effective tool for mapping crustal history on regional scales in difficult or poorly exposed terrains. It is based on U-Pb, Hf isotope and trace-element analysis of single zircon grains by laser ablation mass spectrometry. This information reveals the nature of crustal evolution by tracking the nature and timing for reworking episodes and new mantle input. Terrane-scale events provide a framework for the identification of tectonic signatures associated with different styles of mineralisation and a tool for explorers to prioritise targets.